Product prices and availability are accurate as of 2019-04-10 10:28:05 EDT and are subject to change. Any price and availability information displayed on http://www.amazon.com/ at the time of purchase will apply to the purchase of this product. Never fret over a broken coffee maker carafe again, simply buy a replacement. Serve your freshly brewed coffee from this uniquely shaped coffee pot from Krups. 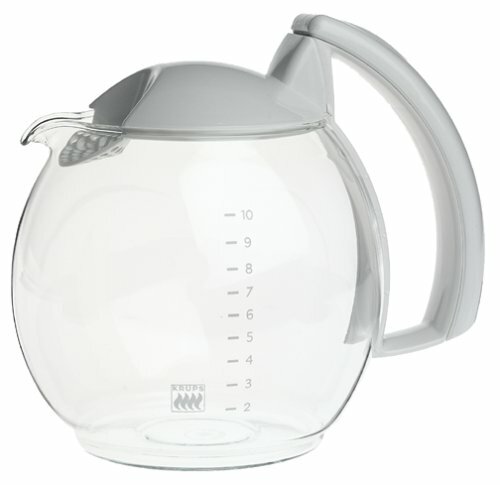 Designed to be used with Crystal Arome models 398, 458, 466, and 467, this carafe features a black handle and lid, water level indicator, and a pour spout to make filling and serving simple. This pot is also microwave safe so you can reheat your coffee if it gets cold.